Your golf swing is a partnership between your athletic skill and your golf clubs. Properly fit golf clubs are the foundation of a good golf swing. Our role is to be your personal golf equipment coach. We fit clubs that are tailored to your skill, fitness and your objectives for your golf game. We have the knowledge, experience, expertise and equipment to fit you with golf clubs that will improve your game. At Fit2Score you will experience golf club fitting not golf club selling. Golf club fitting starts with an understanding of golf equipment. A club fitter MUST also understand golf motion skills, fitness and swing biomechanics. Our fitters are all experienced swing coaches and will not hesitate, to coach while fitting. Your fitting experience will not be focused on selling you golf gear. It will focus on improving your golf game, perhaps with golf gear. I play golf outdoors and I fit outdoors. I do not play golf on a simulator, so I do not do fittings on a simulator. When you watch the ball fly you adjust your swing based on what you see. 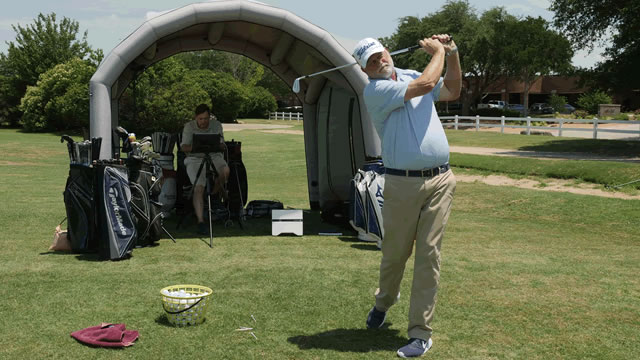 Without the feedback of watching a ball fly, golf club fitting does not work for most golfers. It takes more time to custom fit golf clubs outdoors; the golf swing analysis gear must be set up each time. At times the weather does not cooperate. If you want your clubs fit the same way as golfing professionals gets custom fit golf clubs, call to schedule an outdoor golf club fitting experience. Located 4 miles south west of 114 on Route 26 and 4 miles north of 121 near Hall Johnson Road. Understanding the golf swing is a keystone in golf club fitting. Golf clubs will not fix a golf swing. The very first company to offer systematic golf club fitting, Henry-Griffitts, required that it's certified fitters were golf teaching professionals. The clubfitter must be to be able to look for swing faults, especially "compensations" designed to adjust for poorly-fitted clubs. Without properly fitted clubs, you will either subconciously or learn to adjust your swing to compensate; this means that you may have some swing faults whose ONLY cure is new clubs. But it takes swing coaching experience to recognize what can be fixed with golf clubs and what is better addressed with motion skills instruction. Fit2Score publishes GOLF SHAFT REVIEWS. Understanding the golf shaft is an essential aspect of golf club fitting. Because there was no public source of shaft data, we designed and manufactured a unique instrument for measuring golf shafts. Thousands of golf shafts have been measured and recorded into a database. A great many shaft manufacturers now use the Fit2Score EI instrument in their own laboratories. Golf Shaft Reviews publishes golf shaft measurements, shaft testing results and shaft fitting experience. We are second to none in our understanding of golf shaft fitting.